Obituary – Haughawout, William Henry « Perry High School Alumni Association, Inc.
﻿- son of Mr. and Mrs. W. H Haughawaut, is 17 years old and attended the Ponca City schools for three years prior to coming to Perry. He was born at Ponca City and has been active during his school career here. He has been manager of the Perry band, vice president of the Baptist Union and has also taken an active part in Boy Scout week. William Henry’s favorite hobbies are aviation, photography and radio, and he plans to get into aviation training upon graduation. He has taken part in several one-act plays and had a part in the senior play. William Henry “Billy” Haughawout, Jr. died a natural death in Lakeside, California, on January 20, 1998, at the age of 74. He was born to William Henry and Verta Mae (McKenney) Haughawout on October 14, 1923, in Ponca City, Oklahoma. 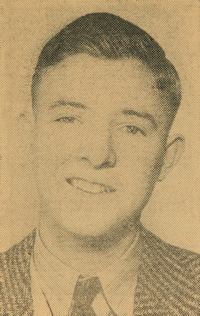 Following his graduation from Perry High School in 1941, he was employed by Consolidated Aircraft Corp.
During World War II he served in the military and was discharged in March, 1946. He married Geraldine M. Boyd and they lived in Enid, Oklahoma for a time where he worked as a mechanic, before moving to California. Both his parents and brother, Clifford, preceded him in death. *This obituary was compiled by the Perry High School Alumni Association from the limited information available.